Sister Nuala Kenny is not your typical religious sister. That’s because she’s also a paediatrician, bioethicist, author an officer of the Order of Canada. 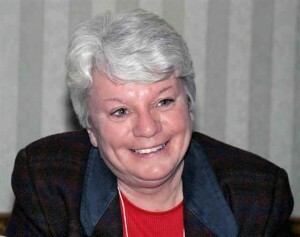 A member of the Sisters of Charity of Halifax, Sr. Nuala also founded the founded the Department of Bioethics at Halifax's Dalhousie University in 1996. Because of her obvious expertise in children’s health and ethics, Sr. Nuala was called upon to assess the aftermath of several clergy abuse cases. One such case was the Winter Commission at the Mount Cashel orphanage in Newfoundland in the late 80s. Following that, Sr. Nuala worked along with the CCCB as a member of the ad hoc committee on child sexual abuse. The resulting document, From Pain to Hope, proposes ways in which the Church can move forward to seek healing for the wounded while simultaneously facing the sins of the past. Recently, Sr. Nuala sat down with Perspectives host Pedro Guevara Mann and talk about her experiences in accompanying the Canadian Church through some of Her darkest times. But with every night comes the morning. And it is Sr. Nuala’s hope that this particular time of shame and grieving will give way to a greater understanding of what went wrong while shedding light on the long path towards confrontation and healing. To that end, Sr. Nuala and McGill University Religious Studies professor Dan Cere have organized a conference October 14 and 15th 2011 in Montreal called Trauma and Transformation: The Catholic Church and the Sexual Abuse Crisis. The conference, which is being hosted by McGill’s Centre for Research on Religion (CREOR), will take place a couple of days before the Canadian Conference of Catholic Bishops (CCCB) is set to hold its annual plenary session. This is a Perspectives discussion you won’t want to miss. That's tonight at 7 and 11pm ET, 8 pm PT.